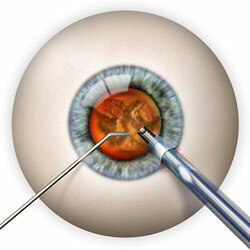 Cataract surgery is one of the most frequently performed eye surgery procedures by cataract surgeon Scott Buck, M.D. at Northwest Indiana Eye & Laser Center. Modern cataract surgery is safe, effective, predictable and quite common and also one of the safest and most successful surgical procedures that you can have. Dr. Scott Buck uses a small incision, “no stitch no needle no patch” technique that is performed on an outpatient basis at the Chandana Surgery Center at Valparaiso Medical Center-which is comfortable, convenient and close to home. The actual cataract surgical procedure is painless and takes less than 15 minutes, with the entire process usually requiring only two hours of your time from start to finish. To assist you and make your experience pleasant our nurses and staff are present to help us with your actual surgery as well as any other needs you might have. When you arrive at the Chandana Surgery Center, the staff will check you in and review any paperwork that might require clarification or additional information. You will be escorted to a private changing area and asked to cover your street clothes with a gown and your shoes with “booties”. Once you are ready you will be escorted to a comfortable waiting area. A staff member will place some drops in your eye to dilate your pupil and your eye will then be treated with an anesthetic so that you will feel little if anything during your surgery and minimal if any discomfort. For most cataract surgery patients this involves having a few sets of eye drops placed in your eyes. Typically, it is not necessary for Dr. Buck to use any injections or needles to anesthetize your eye. In order to help you relax, a small dose of anti-anxiety and/or sedative medication will be given as directed by your eye surgeon. 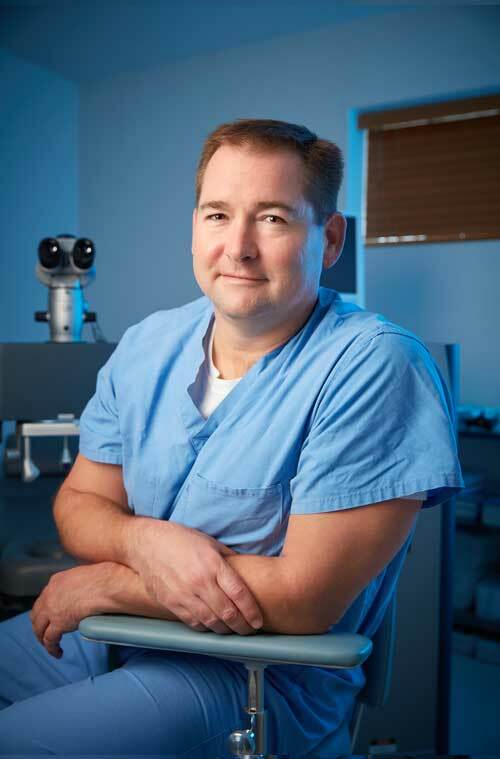 At the beginning of the surgery, Dr. Buck will place a very small incision at the outermost edge of your cornea. This incision will be just large enough to allow microscopic instruments, about the size of a pen tip to pass through it. 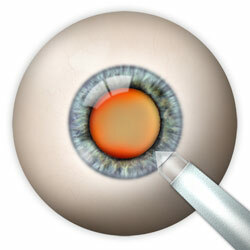 First, a small opening will be made in the membrane or “capsule” that covers the crystalline lens. Next, a delicate sophisticated microscopic instrument will be inserted that allows the removal of your cataract using ultrasound. 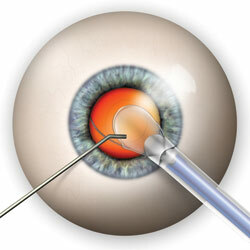 This cataract removal technique is called “phacoemulsification” and is the preferred technique of cataract surgery for most patients. Sound waves or “ultrasound” produced at the tip of the instrument will be used to gently break the cataract into pieces small enough to be washed away, drawn through the instrument and removed from your eye. After the cataract has been removed, your surgeon will insert a new, crystal clear permanent intraocular lens implant (IOL) into your eye. During your preoperative measurement visit, Dr. Buck and the staff will discuss choosing a cataract lens implant to correct your vision and help you see clearly. We can use cataract lens implants to correct vision at distance, arm’s length and up close, as well as astigmatism, so that you are not dependent on glasses after cataract surgery allowing you to have the best results to match your daily activities lifestyle. Upon completion of your cataract and lens implant surgery, one of the Chandana Surgery Center staff members will take you to a comfortable place where you will be able to rest and relax prior to going home. After resting for a short while, a surgery staff member will discharge you and have a family member or friend drive you home. We will arrange for you to be seen at our offices within 24 to 48 hours of your cataract and lens implant surgery so we can examine your eye and confirm that you are healing and seeing as planned. We will also prescribe some eye drops for you. Although each patient will heal a little bit differently, the majority of our patients having cataract surgery are able to see well enough to return to their routine daily activities within a day or so after their cataract surgery. A significant number of men in their 50’s and 60’s and beyond experience an enlarged prostate as part of the aging process. Today, many of men are taking the prescription medication Flomax® or other similar medications such as Alna®, Josir®, Pradif®, Secotex®, Urolosin®, Mecir® that are members of the class of drugs called “alpha-antagonists”. If you are taking one of these medications and notify your eye surgeon or the staff, they will be able to take extra care to make sure the pupil stays dilated to prevent unexpected complications during your cataract surgery.